In the Bayside Precinct, the body of a drowned person bearing the evidence of crude surgery sewn up with embroidery thread is discovered. When a teddy bear is found in the victim's stomach during the postmortem, the police realize that they have a bizarre murder case on their hands. The investigation turns up evidence that the victim was a suicidal internet addict. Bayside Assistant Police Inspector Mashita and the policewoman Yukino start investigating a "virtual murder" homepage the victim had often visited, in search of clues. At the same time, a string of petty thefts is plaguing the Bayside Station Criminal Investigation Section: a watch, a purse, and receipts that Aoshima hadn't yet reported are among the missing items. Suddenly, a swarm of helicopters and undercover cars from the Metropolitan Police Department descend on Bayside Police Station. It turns out Bayside Precinct has suffered yet another serious crime: the kidnapping of the Commissioner of the MPD. The MPD moves swiftly to silence the mass media and set up a special investigation headquarters at the Bayside Police Station. The MPD staff who man the special investigation team refuse to allow any participation from Bayside staff members. 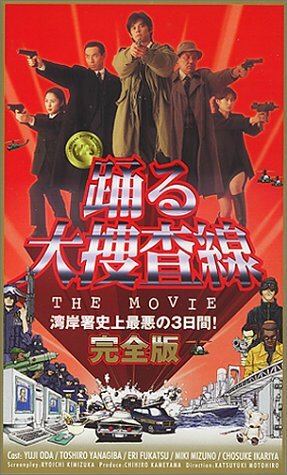 Aoshima's job is to catch the culprit of the bizarre murder, as well as the thief who stole his receipt, but he desperately wants to be involved in a "big-time case" (the kidnapping). He is completely ignored, however, by Senior Superintendent Muroi of the National Police Agency Criminal Investigation Bureau. Since no information is reaching the Bayside Police Station staff from the MPD special investigation headquarters located under their noses, Bayside Inspector Waku undertakes his own inquiry into the kidnapping. It turns out that Waku and the Commissioner had once been colleagues. A bizarre murder, petty theft, the kidnapping of an important personage: what sort of culprits can the investigation possibly turn up? And what lies in the future of Detective Aoshima, who always seems to find himself tangled up in major crimes? The most horrible three days in the entire history of the Bayside Police Station have only just begunc.